Vladimir Kush – The Russian Salvador Dali? You can endlessly enjoy the incredibly deep and beautiful paintings by the talented and undoubtedly interesting artist Vladimir Kush. Looking at his artworks is something like reading a book. Every moment you can discover a new path and the story will find her new twist. In art just like in a real life, there are creative pieces that can make you floored in a second. There are also some unimpressive arts, that will be forgotten after the moment you have seen them. But as you know there are a certain unforgettable and absolutely impressive metaphor-paintings. You can stare at those paintings an unlimited time, but you still will not be able to understand and perceive them to the end. Russian artist Vladimir Kush is the master who belongs to one of those artists who can create those incredible artworks. Vladimir is known as one of the best Russian surrealists. He is not just a great artist but also a significant person worldwide. Vladimir was born in Moscow, where he received his art education, and later on, Kush has emigrated to the United States. His worldwide fame found him in 1993, when a businessman from France, been impressed with his tremendous talent, sponsored an exhibition of Vladimir’s artworks in Hong Kong. He woke up internationally famous the next day after the exhibition was opened. Today artist has 4 own galleries in the United States. 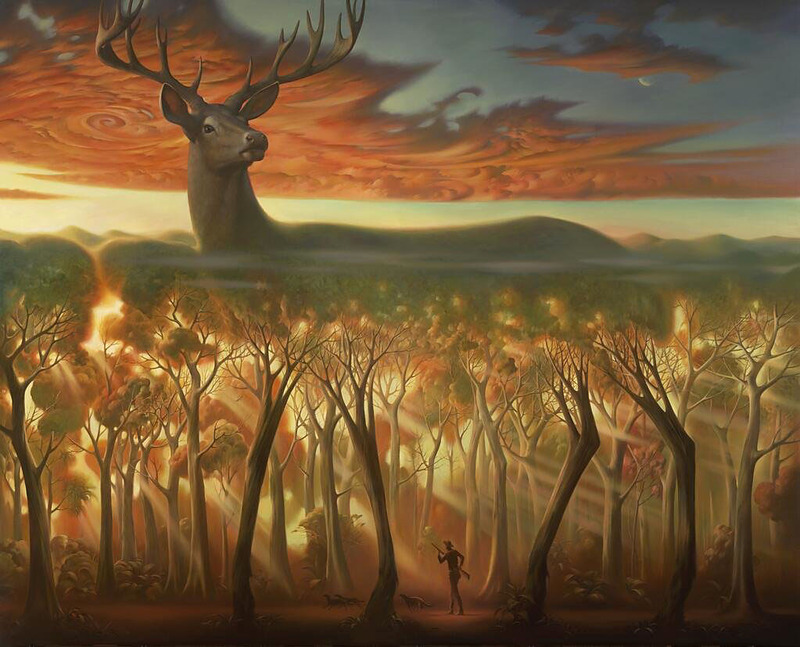 There you can find many Vladimir Kush paintings for sale. Vladimir has been recognized as one of the best masters of surrealism in the world. There is something a specially attractive in his every artwork. When you look at his artworks you get the feeling that you can find your own reflection in every painting. Weird, isn’t it? You will not find in his paintings gloomy colors and shades. Only soft and muted tones and shades that create a feeling of mysterious and warm luminescence. Wellcome to Vladimir Kush Gallery. Enjoy!